Born: 1850, Bourton-on-the-water, Gloucestershire, United Kingdom. Died: 13 April 1912, Durban, South Africa. Henry Ramsay Collins, also known as Ramsay Collins, received training in engineering at the Chester Hydraulic Engineering Company, Ltd, and at Laird Brothers of Birkenhead, England. He subsequently qualified as a civil engineer with the London and North Western Railway and worked on the construction of the Garston Docks and Mersey Reclamation Works. At some time he was elected a Fellow of the Geological Society of London. He came to Natal in 1872 and started a consulting practice as a civil engineer in Durban. In March 1877 he became an associate member of the (British) Institution of Civil Engineers. In 1876 he married Alice Robinson of Durban and thus became a brother-in-law of Sir John Robinson, editor of the Natal Mercury, who became Prime Minister of Natal in 1893. 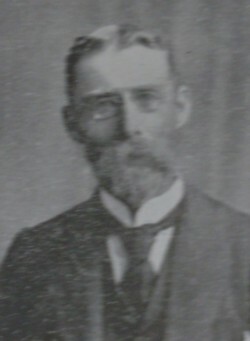 Collins later practiced as a civil engineer in the Transvaal for a few years. He was also a war correspondent for the (British) Daily News during the Anglo-Zulu War (1879), the first Anglo-Boer War (1880-1881), and the second Anglo-Boer War (1899-1902). While in the Transvaal, in 1888, he became a foundation member of the South African Geological Association, which flourished briefly from 1888 to 1890, with its headquarters in Grahamstown. On 15 March 1888 he read a paper before the Chamber of Mines in Johannesburg on "The auriferous conglomerate of the Transvaal, and how to mine it". The paper was printed in Johannesburg the same year. In 1892 Collins became associated with the management of the Natal Mercury, and the next year succeeded Sir John Robinson as its editor. By 1899 he served also on the board of control of the Durban Hospital. In 1903 the business was formed into a limited company, with Collins as chairman and editor-in-chief, positions he retained to at least 1910. He also floated the first Tramway Company, of which he was engineer and manager. His hobby was sport, and he served as a judge in the Royal Natal Yacht Club for 15 years. He was survived by his wife, Alice V. Collins. National Automated Archival Information Retrieval System (NAAIRS). http://www.national.archives.gov.za/naairs.htm Documents relating to Collins, Henry Ramsay/Collins, H. Ramsay. Standard encyclopaedia of southern Africa (Vol. 8, p. 69b). Cape Town: Nasou, 1976.